Several wearers say that the highlight of these Kyrie basketball shoes is their aggressive traction. One shares, "The traction [pattern] does pick up a little bit of dust, but I barely noticed any difference." The curvature in the outsole feels good when doing movements. A couple of testers feel that the feature makes them quicker and a bit more agile. The majority of reviewers appreciate that the traction pattern extends above the footbed because it helps them stop when doing hard cuts. The Kyrie Low feels very responsive since the cushion doesn't compress very much, remarks a user. The shoe’s ability to provide ventilation holds its own when compared to that of other Nike basketball shoes; the material on the upper is thin enough to absorb moisture and keep the foot dry. The majority do not recommend the shoe for outdoor use as the nubs will easily be ripped out due to their softness. Since the Nike Kyrie Low’s Zoom unit is bottom-loaded, many users report to not feel it. A couple of testers would have wanted a little bit more cushioning. Several users are annoyed with the Kyrie Low’s straps as it disturbs them when putting on the shoe. The laces would also get stuck on the velcros teeth, ruining them. These Kyrie Irving basketball shoes have a complicated fit. They are long, but they feel narrow when not broken in. They are also not suitable for wide-footers. The Nike Kyrie Low is an excellent shoe for guards. You definitely can’t go wrong with these Kyrie shoes as they offer aggressive traction that requires little to no wiping, ample yet very responsive cushioning, and a very supportive upper with a reasonably snug fit. One important caveat is that you need to find the right size in order for these features to work and deliver. Even so, there is a good number of reviewers who suggest going for the Nike Kyrie 5 instead because they think it is among the best basketball sneakers of its time. You know, for a $110, I definitely think you guys won't be disappointed. These are one of my favorite Kyries. Honestly, that's a really good price for the shoe because this shoe in particular gave me, a guard, everything I want in a basketball shoe. But in my opinion the Kyrie 4 was the best basketball shoe of the year, and that shoe was a $120. I would just spend the extra $10 to get that shoe. The traction on this is absolutely beastly... It's just a sloppy fitting shoe. The Kyrie Low gets design cues from the previous models of Kyrie Irving’s signature basketball shoes. The midfoot strap is from the Kyrie 2. The geometric embossed patterns in the heel coming from the Kyrie 1. Even so, it is important to note that the Nike Kyrie Low is another line in Irving’s collection; it is not a low version of any of his popular mid-tops. This shoe features a multidirectional traction pattern, Phylon and Zoom Air unit in the midsole, and mesh in the upper; all for a budget shoe’s price. Cushion. The shoe utilizes two bottom-loaded Zoom Air units: one at the forefoot and another at the heel. The units are surrounded by Phylon, which is a foam that provides a balance of compression and stiffness to deliver a responsive ride. The midsole is rounded at the medial side, helping players do hard cuts. This also helps position the feet for an easier take off. Traction. The Kyrie Low’s tread pattern looks similar to the Kyrie 2’s wherein the smaller grooves surround two large pivot circles in the forefoot and heel areas. Smaller nubs form a border around them in an arrangement that ensures multidirectional traction. The tread pattern extends up to both sides of the midsole. Length and Width. The shoe runs half a size longer than expected. It is quite snug and narrow in the midfoot area. However, an expert reviewer mentions that the materials will loosen after some use. Hence, it will be better to buy a shoe that fits a little tighter than usual as the material will stretch. If you have narrow feet, go half a size down. Wide-footers may go true to size. Yet, to be safe, it will be better to try the shoe on personally in your local shoe shop. Lockdown. Containment relies on the Kyrie Low’s slanting laces, midfoot strap, and midsole that extends beyond the foot bed. The slanting laces pull the upper together, enveloping the foot within. The midfoot strap is not only for lockdown but also for support on the lateral side when doing side cuts. The upper is composed of a stiff nylon-knitted mesh with fuse overlays in high wear areas. The fuse protects the material from wear and tear, especially the parts exposed to to such pressures as toe drags. The midfoot strap is made of a textile. The midsole is composed of a Phylon foam and two Zoom Air units. The outsole is a solid rubber compound. The Kyrie Low takes some elements from its signature siblings. Kyrie Irving is known to love some subtle bling on his merch; the embellishments on the midfoot strap and the heel are a nod to this. As for branding, the Nike Swoosh is displayed on the lateral side while Kyrie’s logo is embossed on the shoe’s tongue. Kyrie’s popular symbolisms are also added. The All-Seeing-Eye, for example, is the design used for the lace holes. Inspired by the ultimate childhood vehicle, the “School Bus” colorway comes in an Amarillo yellow and black combo. This is the second time this colorway makes an appearance in Kyrie’s line; it was also applied to the Kyrie 2. Kyrie Irving stars in a movie that revolves around an old man named Uncle Drew who tries to relive his younger days as a basketball legend by challenging street ballers. Little do they know that it’s actually the five-time NBA All-Star behind the white hair and wrinkly prosthetics. 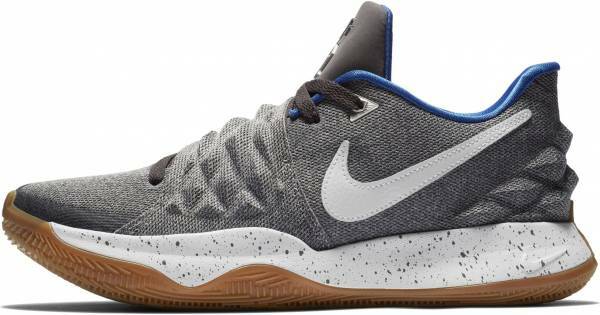 Nike celebrates Uncle Drew by releasing a gray-and-white shoe with a gum outsole.